Former Florida Gators QB, Tim Tebow, is proving his worth in the NFL and doing so by using what the good Lord gave him…his legs. Tebow has been running his way to stardom from ‘GO’ and is not slowing down anytime soon. 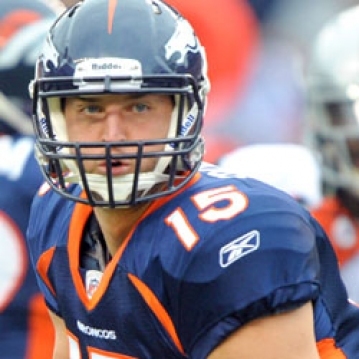 With the 25th overall pick in the 2010 NFL draft, the Denver Broncos selected ‘07 Heisman Trophy winner and three time Heisman finalist, Tim Tebow. Many football experts were surprised that Tebow was drafted in the first round despite his collegiate accolades. As a University of Florida Gator, Tebow took the reigns as starting quarterback in his sophomore year. He became the first college football player to both pass and rush for 20 touchdowns in a single season. He also won the Heisman as a sophomore, becoming the first student athlete to achieve college football’s most coveted personal achievement before their junior year. Although his natural prowess for the game launched his name into the national spotlight, critics believed his passing ability would not translate to the speed of the NFL. 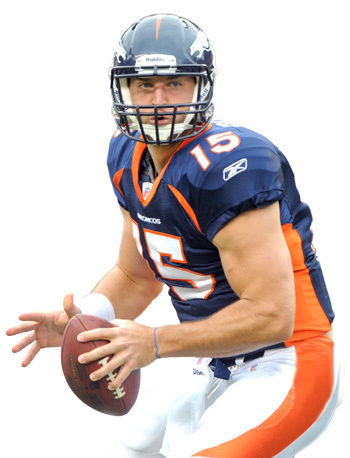 As a NFL rookie, Tebow served as backup QB for most of the ’10 season. He started the final three games for the Broncos while throwing for four touchdowns and rushing for another three. He became the first NFL quarterback to rush and throw for a touchdown in each of his first three starts. Yet again, despite his football triumphs, experts refused to believe in him. Even Broncos management showed skepticism by naming fellow QB Kyle Orton as the team’s starter to begin the 2011 season. After five lackluster performances, Orton was benched at halftime against division rival San Diego and Tebow was handed control of the Broncos offense. He responded by rushing for a touchdown and throwing another. He nearly rallied Denver from a 16-point fourthquarter deficit but ultimately fell short, losing by five in a nail biter. On October 23rd, the Denver Broncos came to South Florida to take on the Miami Dolphins at Sun Life Stadium, a game in which Tebow was honored for his collegiate contributions to the region. Tebow struggled mightily for three quarters but mounted a fourth quarter rally to bring Denver back from a 15-0 hole to force overtime and eventually win by setting up a game ending field goal. Tebow has now started three games for Denver thus far this year. In that span, he owns a 2-1 record, and has thrown for six touchdowns and rushed for a score, while throwing only one interception. In his most recent game against Oakland, Tebow rushed for 118 yards, a mark that any NFL running back would be proud to boast. This performance raises his season rushing average to 80 yards/game, a feat virtually unheard of for a NFL quarterback. Tebow’s strong Christian beliefs serve as a source of strength for him on the gridiron. The son of Baptist pastor, U.S. Army Colonel Robert Tebow, Tim displays his faith by kneeling in prayer at key moments during games. This ritual has come to be known as “Tebowing”. Andrew Plevin, a transplanted New Yorker, has entrenched himself in the South Florida lifestyle for the past eight years. An alumni of Florida Atlantic University, Andrew has made his way as a Realtor in Palm Beach County. While working for Realty Elite in Wellington, Andrew continues his passion for sports writing and continues to aspire towards this profession.